AirPlay lets you stream audio (and video) from iTunes on Mac or your iOS Devices (iPhone, iPad, iPod) to any AirPort-enabled devices at home. This article focuses on using existing speakers or systems you already have (and perhaps paid a lot of money for them) and “enable” them in an easy and cheap way for AirPlay. The main differences between all of those systems are likely the available inputs and if the speakers are “active” or “passive”. So let’s have a look at them in detail to find the best AirPlay speakers for you. I will focus on analog inputs where the AirPort Express is the right and only choice (because of its analog 1/8-inch output; Apple TV only has digital outs). A pretty common scenario would be that you want to stream audio from your iPhone to an “old” existing stereo system in your living room. The speakers are “passive” which means that there’s no built-in amplifier (the amplifier/receiver of the system takes up that role). The system offers several analog inputs for CD, Tape, Aux, etc. as RCA Connector (also known as Cinch) but no digital inputs. An AirPort Express as an AirPlay Receiver which has an analog stereo output for the audio signal. The AirPort Express needs an internet connection. This can be reached in two ways: Either it just connects to an existing Wi-Fi (like any other devices that uses Wi-Fi) or it uses an ethernet connection (ethernet cable from your router to the AirPort Express). A cable with 1/8-inch stereo mini plug for the AirPort Express, and left+right RCA plugs on the other end for the stereo system. Because of this cable you have to place the AirPort Express somewhere near your stereo system. 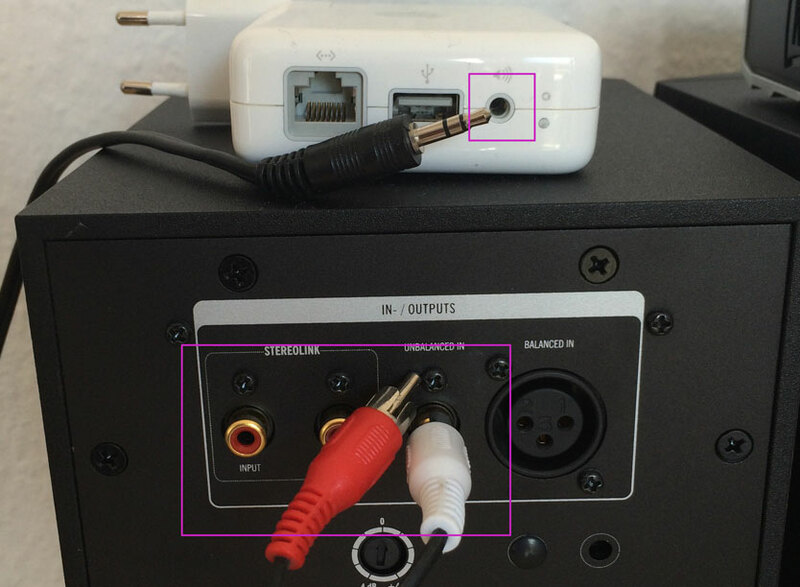 Pretty similar to the first setup is the second scenario when you want to enable AirPlay for existing computer speakers, studio monitors or boom boxes (with an input jack for external devices). Basically, these all are “active” speakers (means the power amplifier is included). A cable with 1/8-inch stereo mini plug for the AirPort Express side. 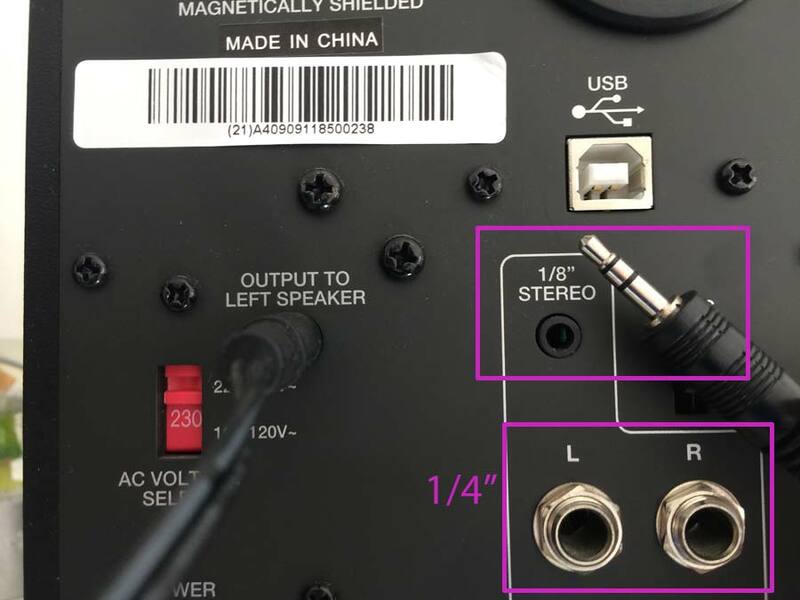 The other end depends on your hardware, but for an analog connection this should be in most cases a 1/8-inch stereo mini plug, two RCA/cinch plugs or two 1/4-inch plugs. That’s all. You can also think about getting more than one AirPort Express, because it’s possible to stream simultaneously to multiple AirPlay destinations. I am streaming music from my Mac, to an Airport Express, and to active speakers, using AirPlay. I am alternatively streaming via USB to a hi if amp. I have set up multi output audio, using utilities to use these two outputs simultaneously, and though it works, only the right channel of the active speakers via AirPlay works. The speakers are fine, and using headphones, the output from the Express is only via the one channel. Yet as I say, selecting the same output on its own, works fine. Interesting. Sorry, no idea… what utilities do you use for the simultaneous output? A minipin splitter gets you two line level outputs. But my question is can two airport express units be set up to stream music to both in sync thus eliminating the wire.